NASHVILLE, Tenn., May 24, 2017 /PRNewswire/ -- Aries Clean Energy's biomass gasification plant just outside Nashville has been recognized as the driving force behind the City of Lebanon's receipt of a 2017 Governor's Environmental Stewardship Award, the most prestigious conservation award in Tennessee. Aries Clean Energy deployed its patented gasification technology in design and construction of the plant that was commissioned in late 2016. 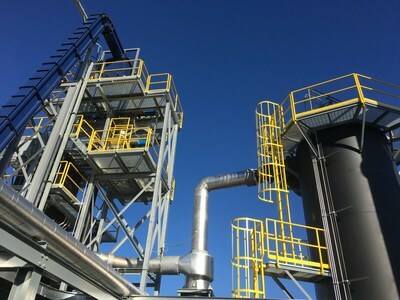 It is the world's largest downdraft gasification facility, and it utilizes a blend of wood waste from local industries, scrap tires from Wilson County and biosolids from the city's wastewater treatment plant to produce green electrical power. "We're reducing landfill use, creating clean energy and keeping thousands of tons of carbon out of the air each year, all with a positive cash flow," said Lebanon Mayor Bernie Ash. "This is a win all the way around." Developing the project involved implementing a partnership between the city and county, as well as a private company, Rockwood Recycling, which specializes in logistics and preparation of commercial wood waste and scrap tires. The gasification plant can process up to 64 tons per day of material and produce 420 kW of electricity utilizing Organic Rankine Cycle (ORC) generators. "This plant is a terrific model of our patented clean energy technology in action, and what public/private partnerships can achieve," said Aries CEO Greg Bafalis. "Recognition of what we built from the state's environmental community is clearly appreciated. At the same time, the award says Lebanon's leaders had tremendous vision and initiative in putting this project together and making it work. Congratulations to Mayor Ash, and each of those council members and public works professionals involved." Aries Clean Energy, LLC, based in Nashville, Tennessee, designs and builds innovative bio-based downdraft and fluidized bed gasification systems using its eight patents granted to date. Its projects provide for the sustainable disposal of waste, reduction of carbon emissions, and the production of clean thermal and electrical energy. The company's ongoing R&D efforts are focused on cleaning syngas produced from waste for use in internal combustion engines.